It’s that time of the year again when event orgaisers and rental companies are busy prepping up stages across India for three days of heart pumping and feet stomping music. While the market for live music in India has grown exponentially in this last decade, there is yet much to be achieved. Though EDMs like Sunburn and VH1 Supersonic are a must attend annual pilgrimage of many from the young India brigade, these festival are nowhere close to their western counterparts like EDC and Coachella. Though India has hosted the biggest names in pop and rock, like Justin Bieber, ED Sheeran and Bryan Adams, many others are yet to experience the music mania in India. In this feature, PT explores opportunities and obstacles for organizing big ticket, big stage shows. India has come a long way since the last decade, when India did not have more than a handful of EDM festivals, with Sunburn being the pioneer. Cut to the present day and you see numerous multi-stage, multi-genre festivals. 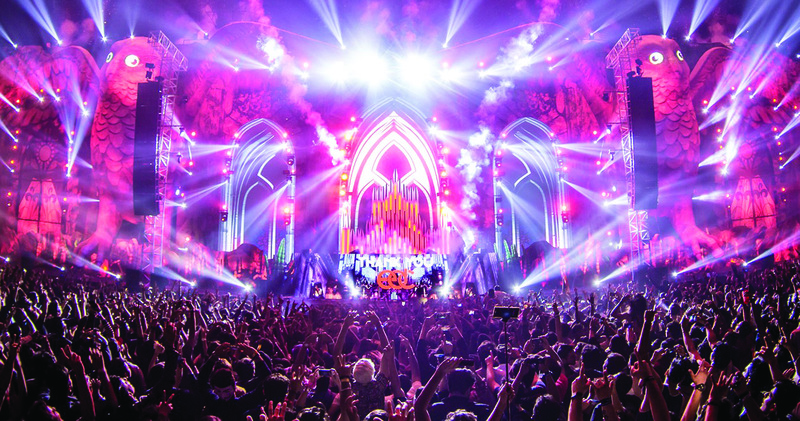 Most of the top EDM events in the country have unfailingly brought down some of the best international DJs like Martin Garrix, David Guetta, Hardwell, Tiesto and Dimitri Vegas. The success of EDM festivals like Sunburn, NH7 Weekender and others, has also boosted the rise in festivals of other genres like pop, folk, sufi, jazz, blues etc. In recent times, India has played host to some of the top international acts from across the globe. While over 45,000 music aficionados apparently filled up the DY Patil Stadium in Mumbai for the Justin Bieber Purpose World Tour, reportedly around 80,000 attended British band Coldplay’s show in Mumbai. From American rock band Incubus to progressive metal band Dream Theatre, American pop rock band One Republic and pop singer-songwriter Ed Sheeran - India has hosted them all. Bryan Adams has toured the nation four times since 1994. A prominent EDM festival organizer was quoted in an interview as saying that beginning with a zero-ticketing revenue, his show had graduated to 60-70 % revenue from ticketing sales. However, are big stage shows really as economically viable, with organisers getting the required ROI or is it all wool over the eyes. Though the Indian live sound industry has grown exponentially over the years, it has still not matured to the point where it can drive business and profits purely from ticket sales. Music festivals and concerts in the country are designed around the sponsorship model as opposed to its western counterparts where gate money is the main source of revenue. For most music festival organisers in India, 70% of the revenue comes via the sponsorship route and the balance 30% from ticket sales. “In India every show has to have some amount of sponsorship because of one reason - ticket prices in India are still not same as what they are abroad. In the western countries, people are used to paying anything upto USD 150 depending upon how big the act is. In India, our ticket prices start at Rs 2,000 or Rs 3,000, so there is no way to get a return on your investment purely from ticket sales. In the Indian context, there has to be a sponsorship model that can give you at least 60% of your cost. If you get 60% from some sponsors (and I am giving you a rule of thumb, it can differ from show to show) then the organizer has some hope that he can break even or even make some money. In India there is no concert that I know of which has made money if there are no sponsors, “says Neale Murray, Co-Founder & COO at Fountainhead MKTG - A Dentsu Aegis Network Company. Besides availability of dates, getting down an international act also depends on the artistes costs, as also their inclination to come down to India. For instance, David Guetta’s show in Bengaluru in early January last year was cancelled over security concerns. Is it right to say then that International artistes may actually demand more to perform in India due to aspects like Safety Concerns and air pollution, we ask. “Artistes will not charge us more because of security concerns, but they will demand that we should have more security measures in place. Yes, that does maybe impact the show to a certain extent, but that is not the real impact per se. The main impact is because in India economies of scale does not factor in. In countries like the US, shows become cheaper for promoters because in one territory (the whole of North America is considered as one territory), the promoter can cover even 30 cities for the same act. So, just between United States and Canada itself, sometimes some of these big acts do only one show in these territories in a year. This is the main reason why many times an Indian show becomes a lot more expensive. The artistes come down to do only one show in Mumbai or sometimes include Delhi and/or Bangalore,” says Murray. “The artists have a fixed fee which is directly proportionate to their crowd pulling capabilities across the world. This does not change,” reinforces Cyrus Gorimar of Opium Events, the company that is credited to having brought down One Republic and Dream Theatre. “I am the only organiser in India dealing with big solo bands, who are the current A-listers. Hence it’s imperative for me to study the market well. When I decide on a content I do so firstly on the basis of Crowd Pulling capacity of the artiste and the respective CPC (cost per person to get them at the venue) and secondly on Sponsor Eyeball. A combination of these two puts me as an organizer, on a safe ground while also creating an experience for the audience as well as the band coming down,” he says. Is it just Incidental Expenditure? Organisers have to foot the bill for everything under the sun - from artiste remuneration to, travel cost for the entire crew, transportation of backline instruments, excess baggage, five-star accommodation, food and drinks and local travel. “The riders which we receive for the international artists depends upon what they are already touring with. Most of the top international acts get everything down with them and travel with their gear for the entire tour. All we have to provide them is the PA system and the power on stage; they get their own backline, instruments, microphones and consoles. Their own engineers and tech team are part of their regular entourage. But, it again depends from artist to artist and how particular they are about what they want,” says FOH engineer Farhad Daruwala. “That’s where the experience and importance of a good touring and rental company comes in as they need to provide their tech team with a PA system as per their specification. If they don’t travel with their own equipment it’s important for us to provide them with exactly what they want and match their tech rider to the best we can,” he adds. Big Stage Live shows in India are not without their fair share of challenges, with the most deterring factor being low ticket prices (as compared to the west) but multiple taxes. Adding to the woes is disbursal of free passes. “Indian event organizers have to pay high taxes to remit the money. For instance if an artist is charging USD 100,000, we have to shell out an additional 35% more for withholding taxes, which the government charges us to remit those 100,000 dollars. Additionally, we have to give away complimentary tickets. Complimentary passes will always be given out, because sponsors demand them, but then at Orange Juice apart from the ones that we are obliged to give just to sponsors, we do not necessarily give out complimentary passes to the general market because we want people to come and buy tickets. In fact, we had once used a tagline, which read, “Complimentary kills Live Music”, because that’s what they do. The Indian mentality is such that people still want to try getting free tickets before they buy. However, I must tell you that a lot of the younger set of people, who I know, believes that if there is a good show then you should be buying a ticket. They don’t wait to get a complimentary. This is the buying mentality that we have to incarnate in India. This will change in time; this is not going to change overnight and the more shows that happen, the faster this will come to play.” informs Murray. Bogged down with additional issues like peculiar rules and regulations, red tapism, lack of a systematic process for a single-window clearance, lack of great venues and logistical challenges, India has in the past been witness to numerous live shows getting cancelled abruptly. While Guetta’s show, was called off due to security concerns, stand-up comedian Jerry Seinfeld’s show was cancelled apparently due to issues like licensing and parking. The technicians and the production team have their own challenges. “Small problems like venue permission issues and delay in getting power can end up creating a backlog in the production schedule. But these issues are today far and few. If it’s a very big production, then they already have a very good event and production company taking care of the riders so these problems are foreseen and avoided. Another challenge and rather an important aspect is giving importance to safety norms for the crew. Making sure they have all the required protective safety harnesses, flash lights and proper rigging gear while on the job. It’s good to see many production and rental companies now giving priority to this too,” says Daruwalla. “We very rarely get a layout of the venue, so console location is always a fighting point. Very often, we have to set it up on the side or at the very back in the corner. This is not an ideal position for the console to be in; it’s infact nowhere even close to the ideal position,” says Vijay Benegal, FOH for trio Shankar, Ehsaan and Loy’s concerts. “In terms of time and schedules, I would say 90 percent of the time the stage is not ready when we arrive for sound check. This is mainly because the event organisers do not want to spend money. They compromise on all these technical issues while wanting things to look fantastic. They are not ready to spend Rs 10,000 more to get better equipment or better vendor,” he adds. “If you consider the kind of investment that we have made to procure these equipment and compare it what we are being paid, then it’s not even close to big enough,” says Sachit Subramanian of NJSM rentals. Organisers on the other hand, have a different story to tell. “The vendors in India like to milk the entertainment agencies when they get involved with International Bands, touring India. The artists are most of the time very open to discussion with regards to certain elements of the technicals not being available here. The only aspect they hate is SURPRISES. Keep them updated and all sails through, says Gorimar. To get returns on investment, organisers have to book big-budget international artistes to draw in the audience. In turn, big names need great opening acts or headliners. However, does paucity of good opening acts, act as a deterrent and impact these big shows? With most of India being largely inclined to Bollywood, most of these artistes (and even EDM shows) have to rely on Bollywood for their acts. “There is no paucity of BIG bands in India. Some of the names are still around and have opened for the biggest bands in the world. Indus Creed, Parikrama and BRAHMA are a few. The issue is with the extra monies that goes into the technical requirement for the bands. As I believe in no compromise for any artist, the monies on the rider for the opening band goes up too. In addition to this, the time required for the respective opening act set up, eats into the budgeted time for the main act. I have some things lined up for 2019 wherein these will change for the better,” says Gorimar. Though the live stage industry is plagued with overwhelming difficulties, many in the industry are optimistic of the future due to key factors, which include a majority of young population who are keyed-into music genres other than Bollywood, rising disposable income and easy availability of live stage equipment.